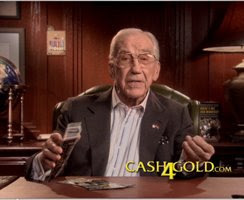 We've seen the commercials, heard the ads and all know Cash4Gold is a huge scam. But since I'm waiting for an epic downfall I keep clicking on stories that mention them. Click on the link if you enjoy shaking your head in amazement! I have read the story as well the person was far from a reporter he was a friend of a prankster blogger, This blogger also sent in fake gold to goldkit.com and bragged when he got a dollar for scamming them that is called fraud. I am taking no sides just stating fact. Fair is Fair! I also read that Cash4Gold actively scours the internet finding stories related to their crappy service. I call Shenanigans on this comment!